Former San Francisco 49ers head coach Mike Singletary's skills with the X's and O's — the nuts and bolts of coaching football teams — were suspect enough. But even if he was deemed adequate in that regard, his persona made his suitability as coach of the 49ers questionable. Society has not reached the point yet where the "fiery black man" approach is acceptable for CEO-type positions, especially when it doesn't deliver positive results, as evidenced by San Francisco's 0-5 start this season and its current record of 5-10. Unfortunately, the same attributes that led Singletary to a Hall of Fame career as a Chicago Bears linebacker practically doomed him as the 49ers' head coach and helped lead to his firing on Sunday. We can never forget pictures of Singletary as the wild-eyed tackling machine, anchoring the Bears' defense with ferocious intensity and passion. One reason the memories remain fresh is that he kept much of that same demeanor in leading the 49ers. And it couldn't be more out of place in the NFL, which embraces its image as a button-down, Fortune 500 conglomerate. 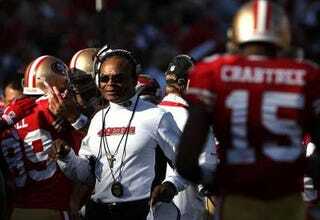 For an instant injection of emotion and excitement, Singletary was a fine choice when the 49ers gave him the full-time job in December 2008, after he went 5-4 as the interim coach. Nicknamed "Samurai Mike," he became a pop culture phenomenon in his very first game at the helm. While he was interim coach, Singletary sent star tight end Vernon Davis to the showers with more than 10 minutes remaining in the game, and issued a classic rant — "I want winners!" — in his postgame news conference. It was later reported that Singletary mooned his players at halftime as a motivational ploy, though a team spokesman stressed that the coach never dropped his drawers. The last example of Singletary's combustible nature came in Sunday's loss at St. Louis, when he engaged in a prolonged and heated exchange with 49ers quarterback Troy Smith. Earlier this season, TV cameras caught him in the face of 49ers quarterback Alex Smith. Such conduct is simply unbecoming of a head coach in the NFL. Football is an emotional game, but championship teams usually possess coaches who remain calm and collected in the most stressful scenarios. Think of New England's Bill Belichick and former Indianapolis coach Tony Dungy. There are exceptions — such as New York Giants coach Tom Coughlin, who berated his punter on the sideline after a game — but that style is rarer and wears thin quickly when a team isn't winning. Besides, history suggests that it's riskier for black men in high positions when they lose their cool or become too "colorful." Black men have been hampered through the ages by negative stereotypes, considered susceptible to emotional outbursts and uncontrollable anger that makes them undependable in leadership roles that require clear, levelheaded thinking. In the NFL, a head coach has the same type of prominence because he's the public face representing management. Television cameras are constantly aimed at the coach during games as commentators and viewers interpret facial expressions and body language. The coach holds multiple press conferences during the week, and his words are parsed for hidden meaning. His actions are scrutinized in newspapers, blogs, sports radio discussions and TV shows. Under that high-intensity microscope, the best approach is steady and stable. Singletary was the opposite. Aside from the spectacular shouting matches with his quarterbacks, he jerked them in and out of the lineup all this season. He fired his offensive coordinator after Week 3 and watched another top assistant resign after Week 13. Singletary didn't even wait to see which direction the season was headed before jumping into (overre)action, calling an emergency team meeting after the first game and talking smack about the defending Super Bowl champion New Orleans Saints during Week 2. That sort of behavior might have worked back in the days of Mike Ditka, Jerry Glanville and Buddy Ryan, but the NFL is more conservative now. Denny Green, only the second African-American head coach in the modern NFL era, had an infamous rant ("The Bears are who we thought they were!") and other controversies, but he also went 97-62 with the Minnesota Vikings, leading them to the playoffs in eight of his nine seasons. However, every NFL coach, and especially African Americans, would be better off following the levelheaded example set by Dungy or his protégé — fellow African American and Super Bowl winner, Pittsburgh's Mike Tomlin. Deron Snyder is a regular contributor to The Root. He can be reached at deron@blackdoorventures.com.